There are a lot of changes going on out there these days! Time to check in on the neighborhood trees. You can tell that things are really starting to speed up now. The change in the last six days is quite dramatic. 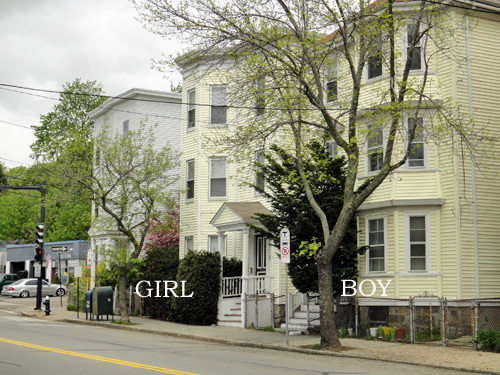 Our girl ash down the street also looks quite different. She's lost all of her leaves! All that's left on the tree is the fruit. And she's also lost her low-lying branches that I had so often photographed. Yes, the men with pointy sticks have been back, diligently pruning back all the trees I've been following! Grrrrr. 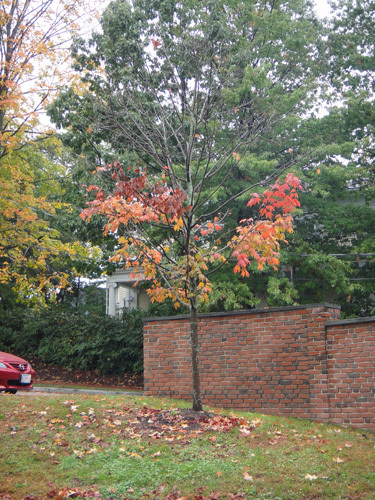 Then there's the maple I spotted by my kids' school. It turned bright red early on. See the lower leaves that were still green back in September? Well, those are all that's left on the tree now! 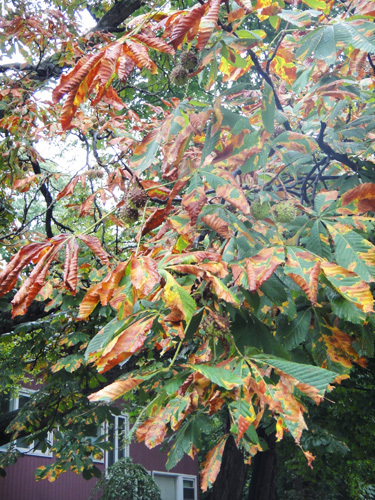 The chestnut tree I've been watching still has plenty of leaves, but it has been dropping stuff like gangbusters! Even the slow oaks seem to have picked up the pace. 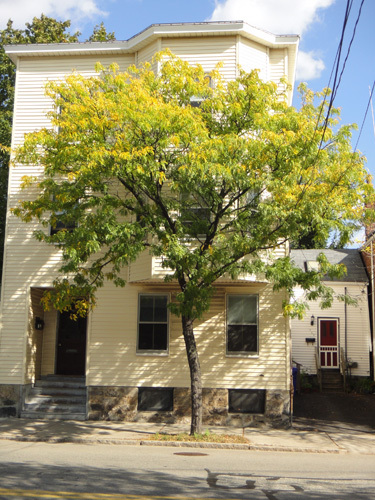 And the slowest of all, the kooky honey locusts, are finally getting in on the fall fun. 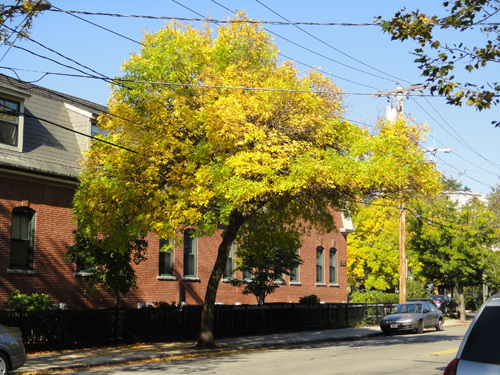 it's fall, do you know what your tree is doing? 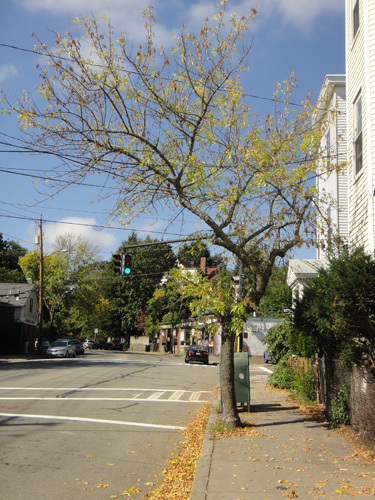 So on this first day of fall, we know what the ash trees are up to but what about the other trees? Well, the maples, which have revealed themselves to be among the first trees to respond to the changing seasons, are really progressing. 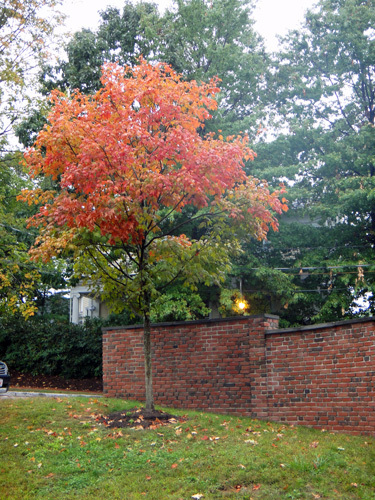 One maple at the boys' school is almost entirely red! 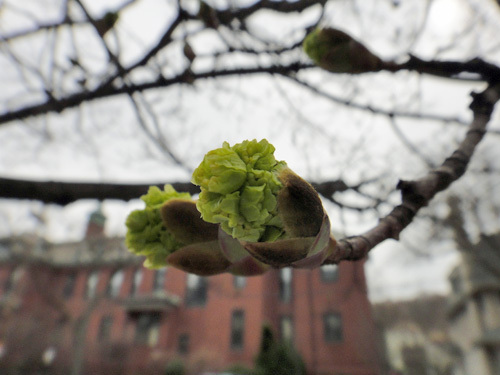 The oak trees were among the last to get started growing leaves in the spring. And, no surprise, they are still as green as they have been all summer. I had to look hard to find these three dead leaves on an oak by the park. So I'm sensing a pattern here. Early to rise, early to bed. 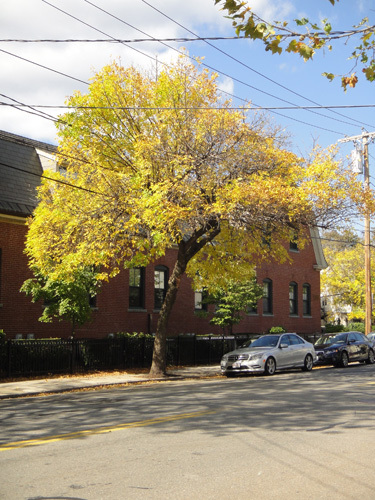 The trees that grew leaves early in the spring are changing colors earlier in the fall. Am I right? The kooky honey locusts are also still very green. (Hey, they were also very late getting their leaves!) 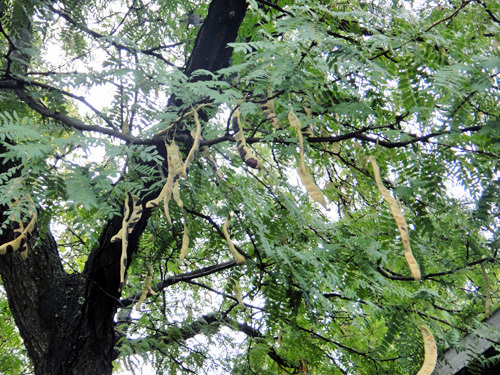 But while their leaves are still green, the seedpods are turning dark yellow and look like they are drying out. They kind of remind me of snake skin after the snake is done molting. 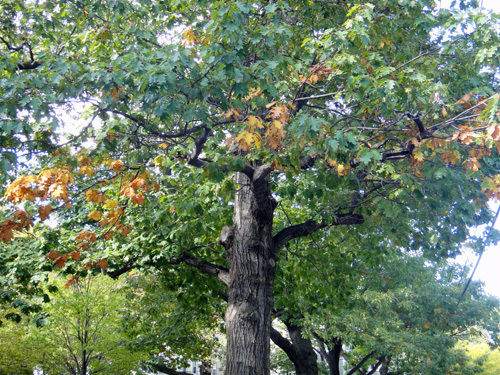 And then there's the chestnut that's been looking like camouflage for the last couple of weeks. Some of the leaves are now completely red and curled up. Are those ready to drop?! 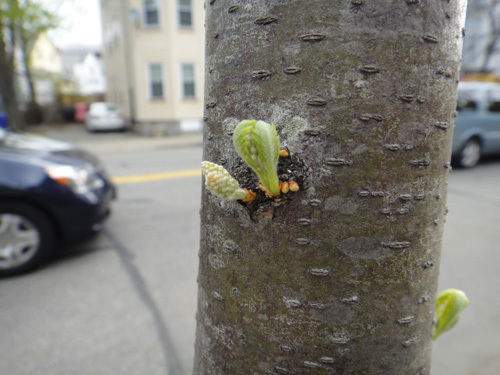 What are the trees in your neighborhood doing? We took a walk around the neighborhood on Sunday evening, just after the worst of the winds and rain from Hurricane Irene were done. 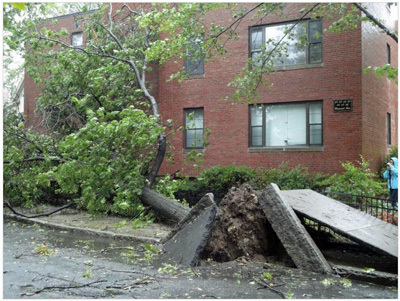 From the looks of things, the trees seem to have taken the brunt of the storm. 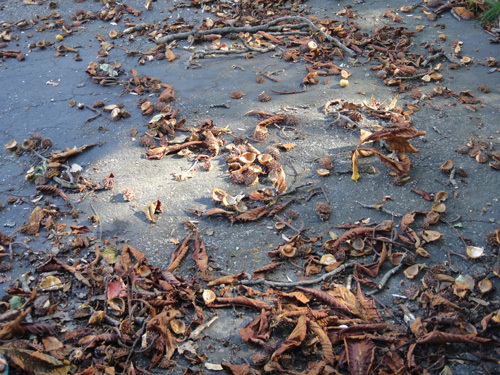 Twigs scattered across the sidewalk and street from a large oak tree. 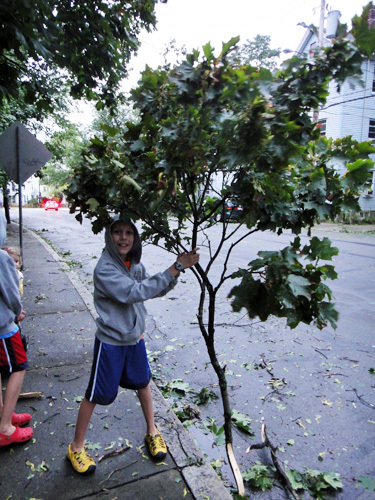 My son picks up a large branch that fell from a maple tree. 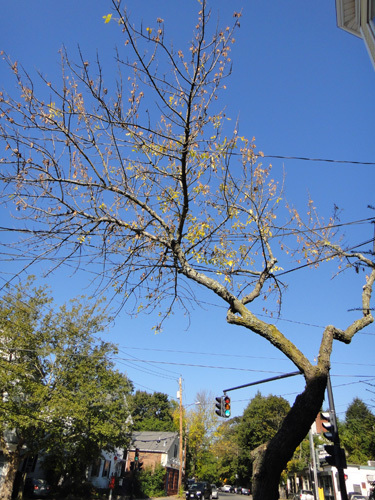 An ash tree that I've posted about before lost a huge branch. 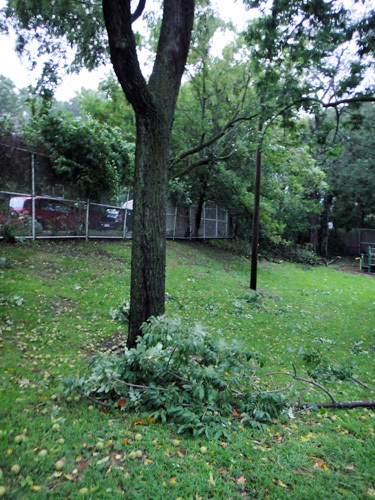 And a black walnut tree on the playground also lost a branch and what looks like all of its fruit. They are everywhere! 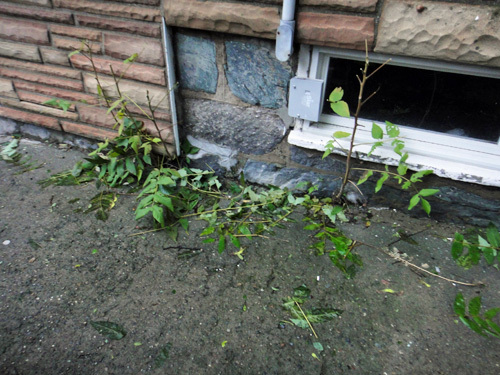 Closer to home, the ailanthus super tree saplings were pretty much decimated by the winds. 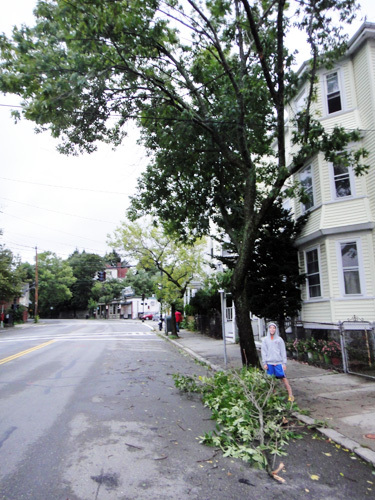 But the neighborhood must have suffered even more serious tree damage than what we found, because we lost power due to downed trees at about 2:30pm and didn't get it back until 10 hours later. 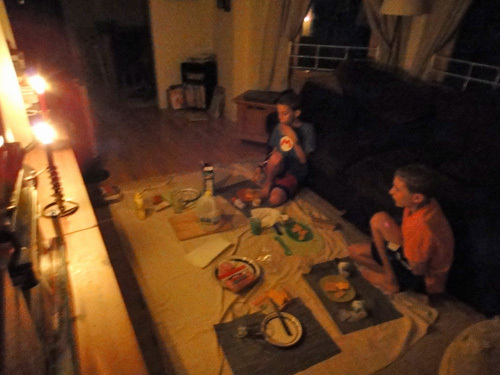 We had dinner at dusk in the living room by big windows and several candles. When the power came back on we were able to read online about the big trees that had been damaged and had caused the power outages. 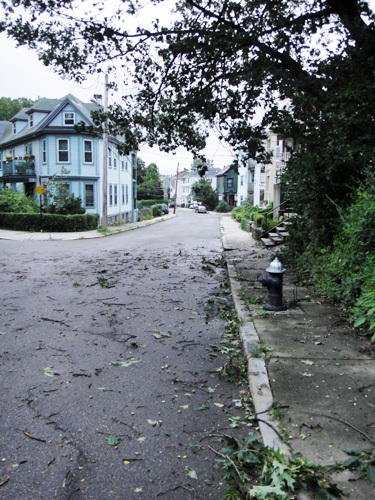 There are still about 100 residents in the area who have no power. Thank goodness that's not us. We were lucky. This tree stands in my in-laws' backyard. 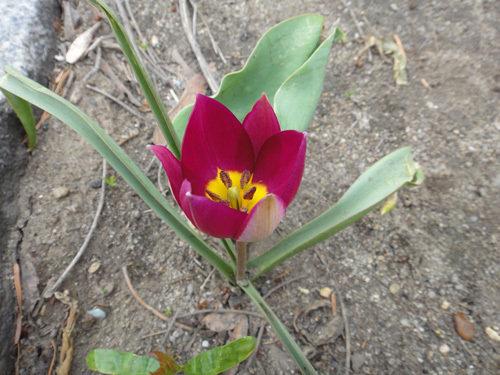 It was planted by the kids' great uncle. 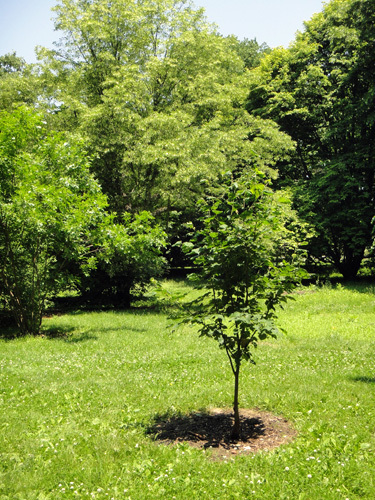 When he was in first grade, each of the students got a sapling to plant. 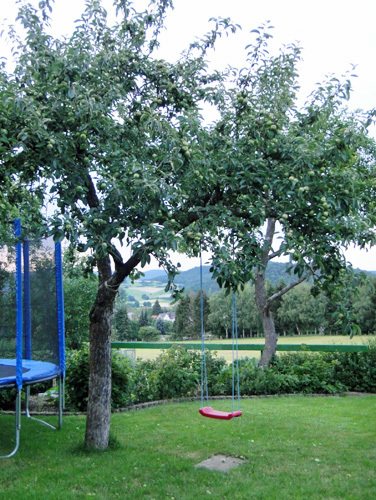 Sixty years later, it has become the perfect tree for the kids to swing in. My mother-in-law's family has a little toy and paper goods store. The kids save up their Euros from birthdays and Christmas every year to buy themselves something fun at Oma's store. 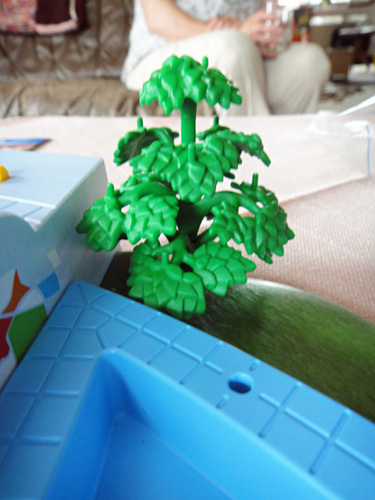 This year, my daughter got herself a big Playmobil set with a pool, a slide, a shower, and a tree. Hubby and I spent the last couple of days in Bavaria. 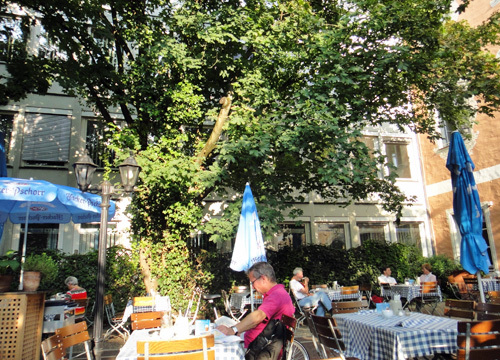 One evening we relaxed in a lovely beer garden. 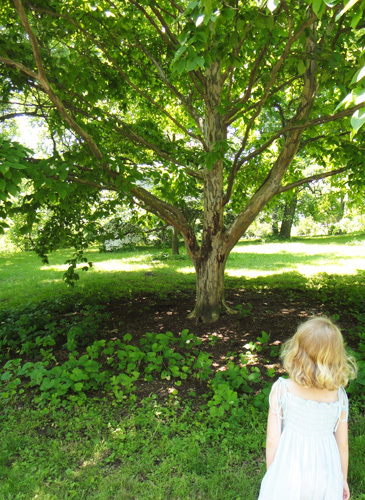 We sat under two chestnut trees and had a view of this maple. 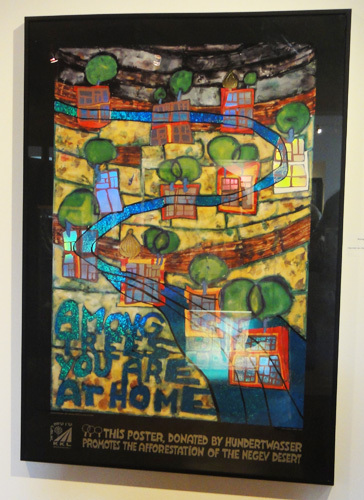 I love the colors and shapes in the work of Austrian artist Friedensreich Hundertwasser! While in Bavaria, we came across a little exhibit of some of his posters in support of environmental causes. He made posters encouraging people to save the whales, save the seas, and use public transport. In this poster, he tells us that among the trees we are at home. The bright green bulb trees are fabulous! School's almost out, which means we have just enough time to squeeze in one last field trip! 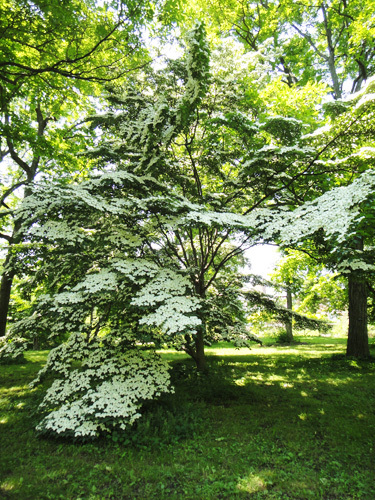 Today we're off to the Arnold Arboretum, which is only about 10 minutes away from us. We'll be back in time for lunch! The arboretum has some fun family activities including their Tree-of-the-Month program which we'll be focusing on today. 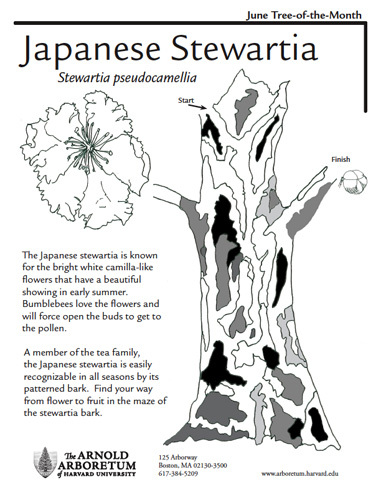 Each month, they pick a tree species, put together a little handout about it, and hide a letterbox by one of those trees somewhere in the arboretum. The handout provides directions which lead you past other interesting sites and then to the letterbox tree. If you don't know what letterboxing is, don't worry; neither did I! It's sort of like geocaching. Someone hides a box in a public place like a park and lists its location in a directory. Inside the box, there is a rubber stamp and a notepad. If you have your own stamp, you stamp it in the notepad and add your name to the list of folks who have found the box. Then you can stamp the letterbox stamp in your own notepad to keep track of where you've been. 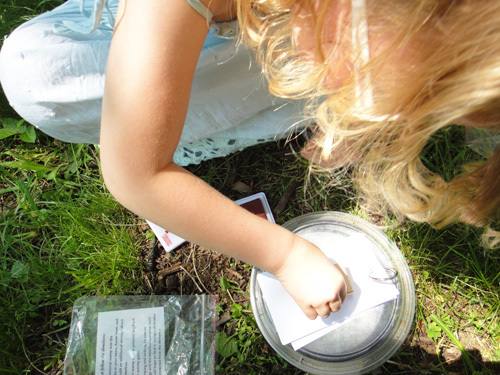 The letterboxing makes the hunt for the tree of the month very exciting for kids. 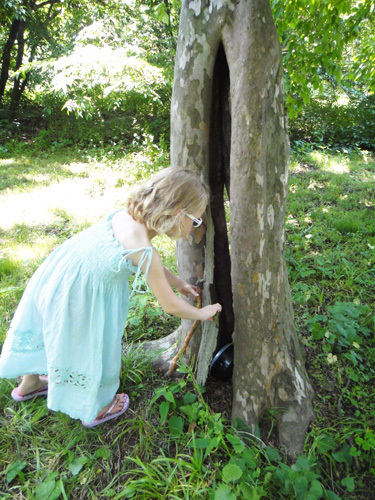 My own daughter couldn't wait to go looking for "the box tree"! 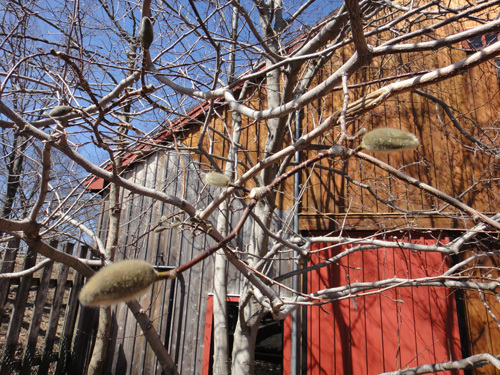 This month's tree is the Japanese stewartia. 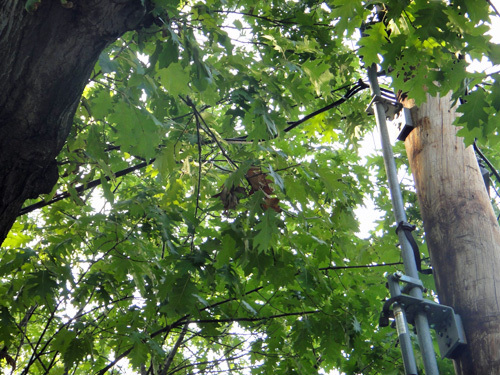 The directions on the handout told us that to find the letterbox tree, we first had to walk down Linden Path. 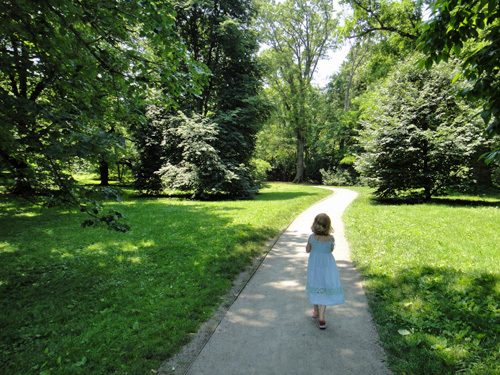 Initially we found oak trees along the path, but then we came to the lindens. 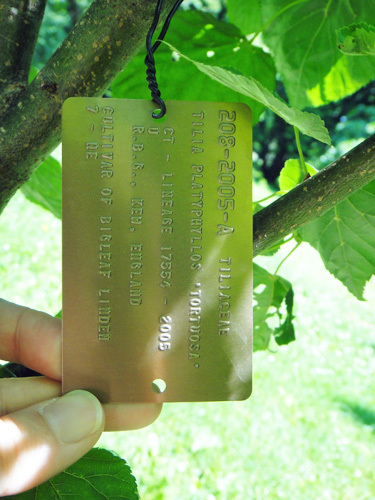 I know nothing about lindens so I only knew we'd found them by looking at the tags on the trees. 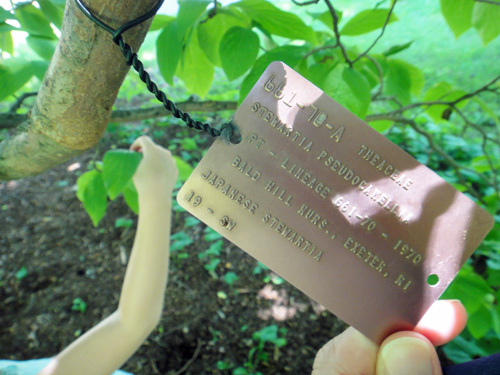 Every tree in the arboretum is labeled with a cool tag like this. It tells the species of the tree, how old the tree is (did you know there are over 700 trees in the arboretum that are 100 years old or more?! ), and information about where it came from. This tag told me that this tree was a Bigleaf linden. It was, however, very little. 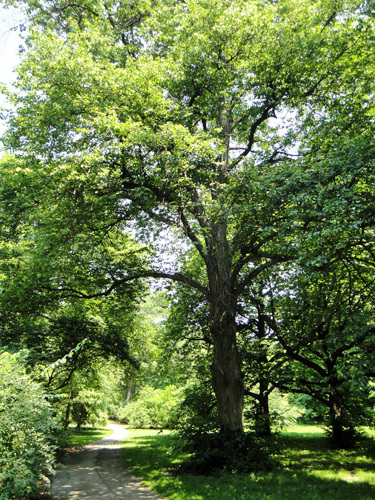 A few steps farther on the path led us to a Littleleaf linden that was very big. 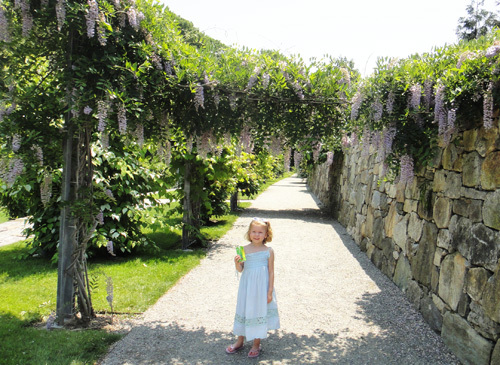 The Linden Path ended at the Shrub and Vine Garden where my daughter fell in love with the wisteria archways. 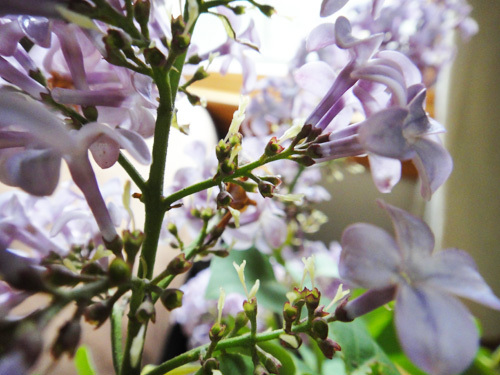 She kept calling them lilacs and they did look like lilacs with their clustered, purpley flowers. But the cool tag told me they were wisteria. And a close-up look revealed that these flowers are quite different from the lilac flowers I've seen in the neighborhood. 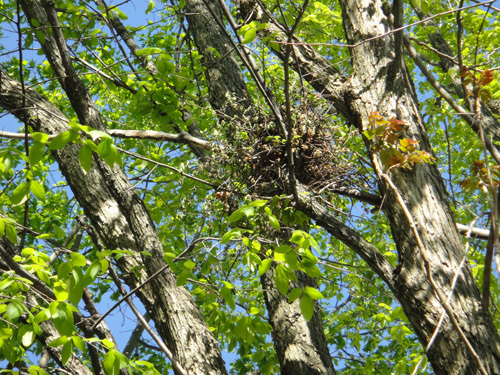 Instead of blooming on branches that grow up, these are in bundles that hang down. And instead of flowers that are open, these are funny little folded up tube-like flowers. 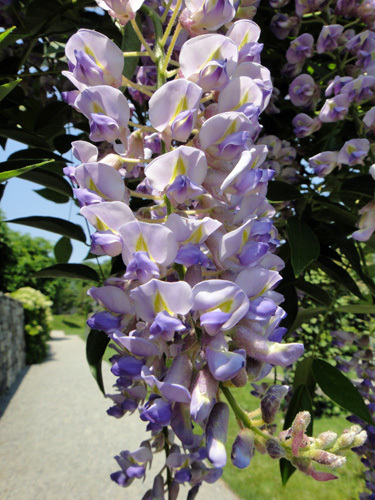 So wisteria is not a lilac, but don't try to tell my daughter that. After our trip through the Shrub and Vine Garden, we were back on the main path and were directed to a Japanese stewartia across from a bench. Look at those amazing flowers! It's like it's covered in snow or something. Fabulous. But we must continue on to the letterbox tree, my daughter reminds me. Okay, the directions say 15 more steps and we'll find another stewartia with the box. We opened it up. We did the stamp. We high-fived. We were bitten by mosquitoes. 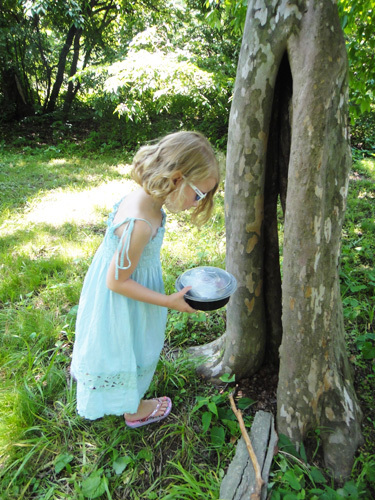 Then we packed everything back into its waterproof baggies and put the box back in the tree for the next person to find (maybe you - bring bug spray). 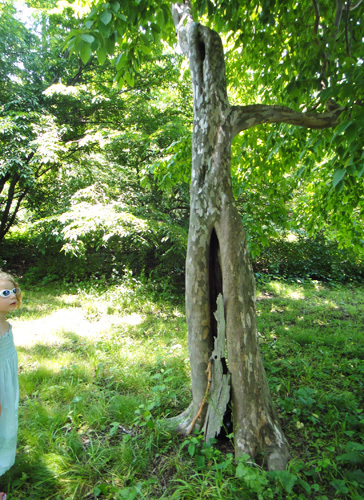 My daughter and I can't wait for July so we can search for the next letterbox tree! 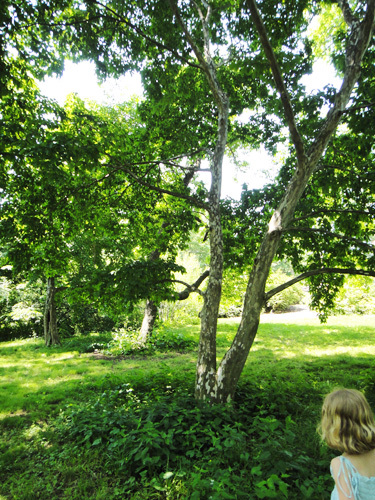 In the meantime, we might go back to see the Explorers Garden. My fourth grade boys just finished a unit in school on explorers. I wonder what they would think of plant explorers like E.H. Wilson. We could look up the original countries where he collected the plants on a map and talk about how they were brought back to Boston. The handout for the Explorers Garden says that after one of the plants was collected in 1911, the team was hit by a landslide and Wilson was seriously injured causing them to return early. Both he and the hemlock seedling survived. Exciting stuff! I don't remember much from the time when I was in elementary school, but one thing I do remember is when we'd get a quiz that was right off the ditto machine. It was usually slightly damp,with that faded bluish type, and had that strong ditto smell. Dittos seemed so fresh and clean and homemade. 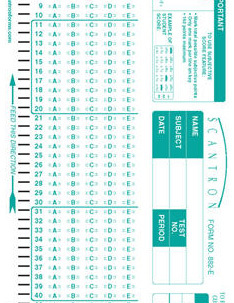 This memory provides a stark contrast to my memory of tests in college, where we used computerized, paper-cut inducing, buy-your-own-and-bring-them-on-test-day scantron sheets. This whole stroll down memory lane is really just a way of saying, it's test time on the tree blog! I wanted to come up with an assessment that wasn't about memorizing vocabulary words or choosing the best answer from a group of intentionally similar and tricky choices. 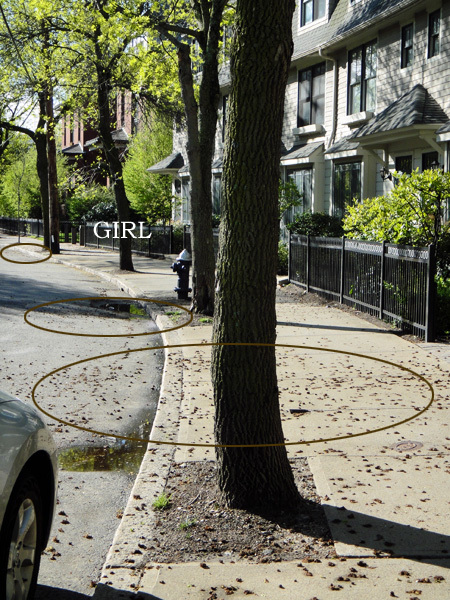 Instead, I wanted this assessment to be in keeping with the way I've been learning about trees. And, if possible, I'd like it to smell good. First, let's look at the leaves. 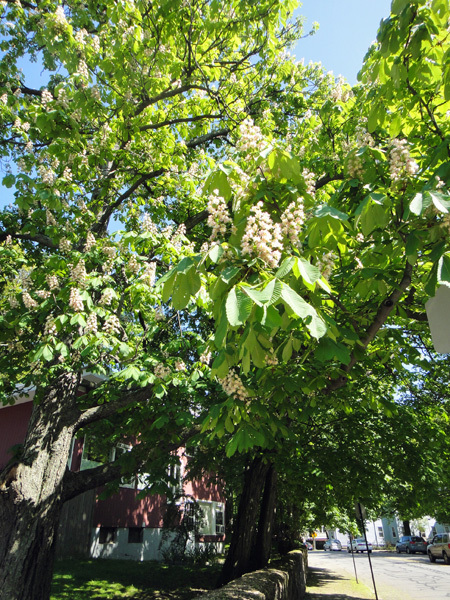 The lilac tree has broad leaves (that just means that it has leaves and not needles). They are single leaves (not compound leaves like my ash tree), which are not lobed (like the maple leaf), with smooth margins (unlike the toothed edges of my tree's leaves). They are symmetrical, with an oval shape and pointed tip. The veins branch off the main center vein at different points rather than all branching from the base (as in this leaf from a Japanese maple). 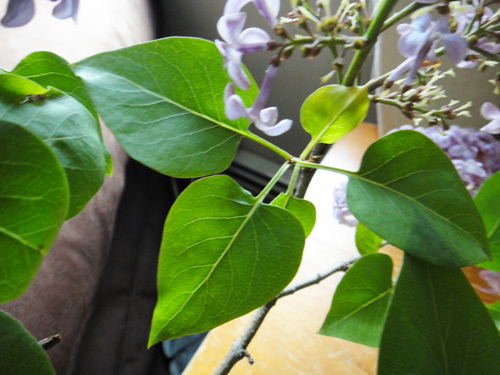 Looking at the way the leaves and flower clusters are growing out from the stem suggests to me that the lilac tree has an opposite branching pattern. 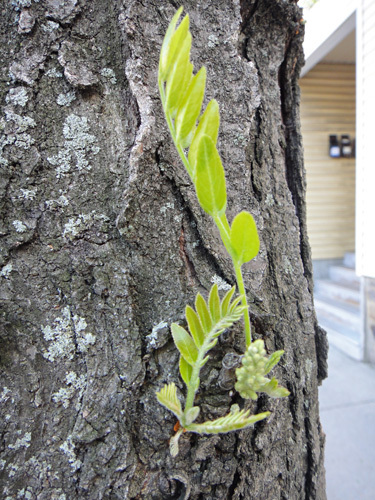 There are pairs of leaves growing off the stem from the same spot in opposite directions. The twig, too, seems to have this same pattern, although it is slightly different from the opposite pattern of the ash tree that I've been following. 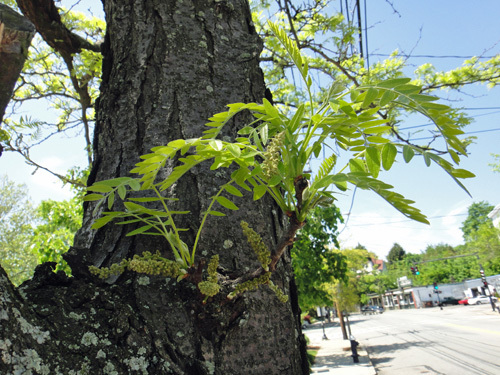 My ash tree always has two opposing stems growing out of one main twig, which continues in the center. It looks like this. 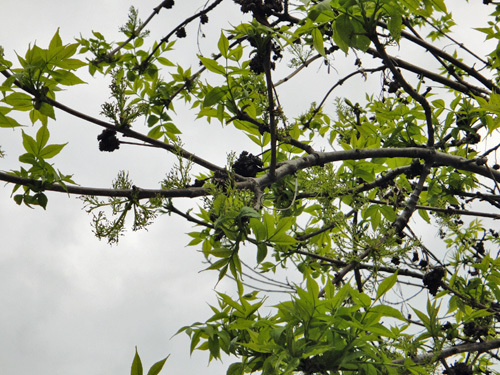 But the twigs of the lilac tree seem to often simply split into two opposite branches (as seen at the bottom of the above picture). 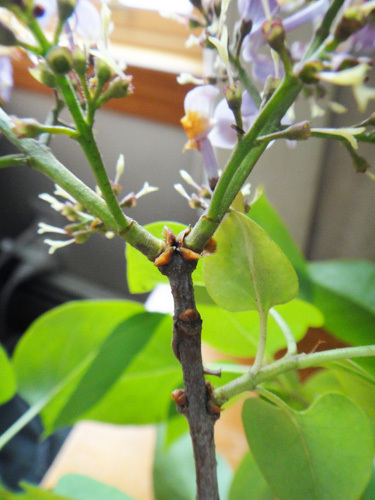 The picture below shows how one twig ended with two terminal buds which opened up to grow two shoots that held flowers. Notice how the twig does not continue in the center. 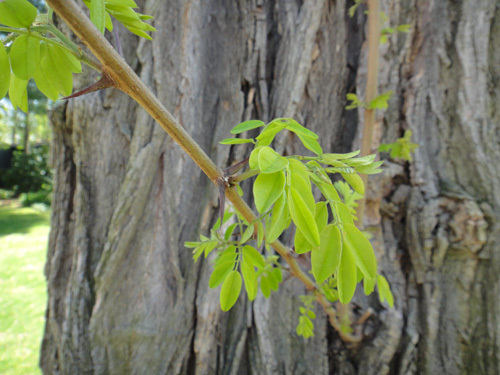 The green stems in this picture however do have a structure more similar to my ash tree, where the center stem continues. 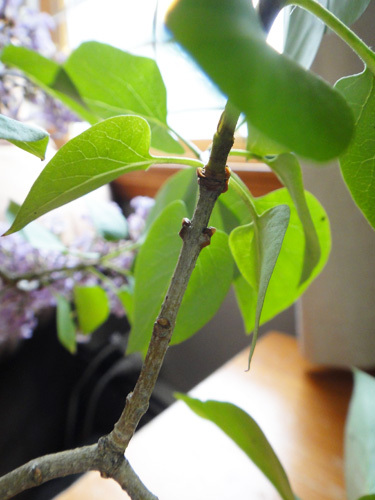 I'm thinking that the lilac twigs may split into two just at the tips. Another interesting thing I notice in this picture is that some buds have opened up to produce leaves and some have opened up to grow flowers. 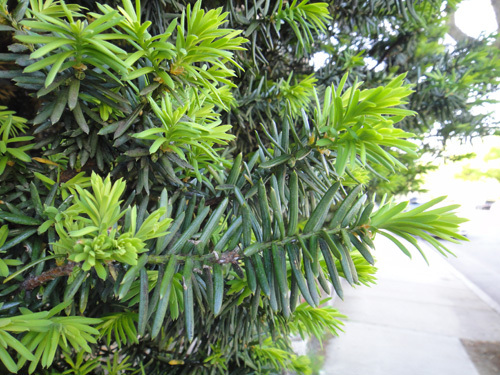 The flowers and the leaves do not appear on the same stems. 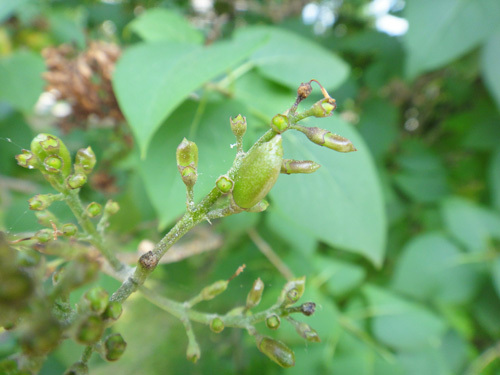 I wonder if only the terminal buds are producing the flowers, while all the lateral (side) buds are producing leaves. 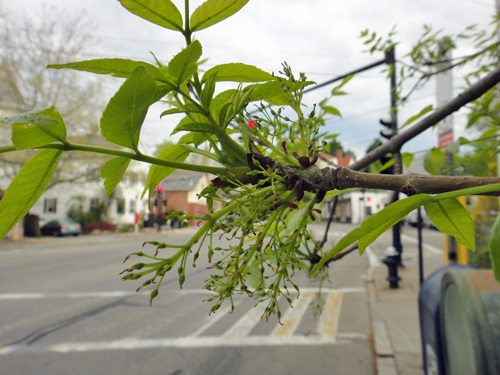 I've seen that on some trees in the neighborhood (of course, my ash tree is just the opposite, with the terminal buds only producing the leaves). Now, let's take a look at those flowers. 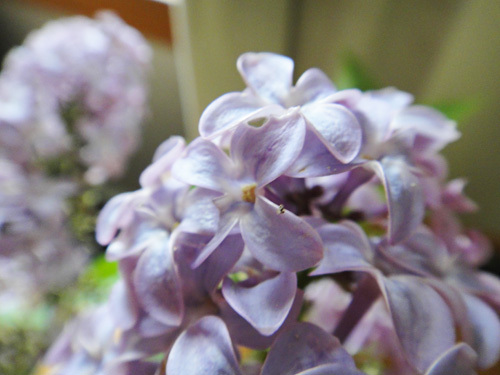 The lilac flowers themselves are, true to their name, a beautiful pale lilac color. They each have four petals and grow in clusters. One flower stem has many pairs of opposite branches that continue up the stem. 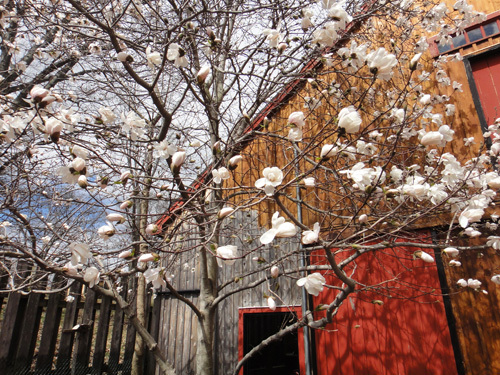 Each one of these branches produces one or even more flowers. This creates the long oval bundle of flowers that are typical of lilacs. The center of the flower holds the various girl and boy parts. I couldn't get a great close-up, but I'm thinking that the yellow center may be the male pollen-producing parts. If we look closer at the stems where flowers have already fallen off, we see only a long, white structure remaining. I'm guessing that this is the female part of the flower: the ovary that would produce the fruit. There's no need for the male part of the flower to stick around, so it makes sense that this is the only part the tree would keep. I wonder what the fruit will look like.... UPDATE: I walked past the spot where I found the lilac twig and found some developing fruit on the tree! I see one large seed-looking fruit developing. It looks like the long white things have disappeared or shriveled up (see the top middle of the picture) and these little seed things are growing out of the buds now. Fascinating! Okay, time to check my work! 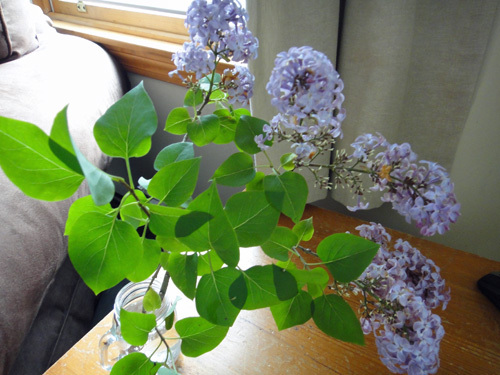 This is a little tough because most tree id keys that I can find online do not include the lilac. 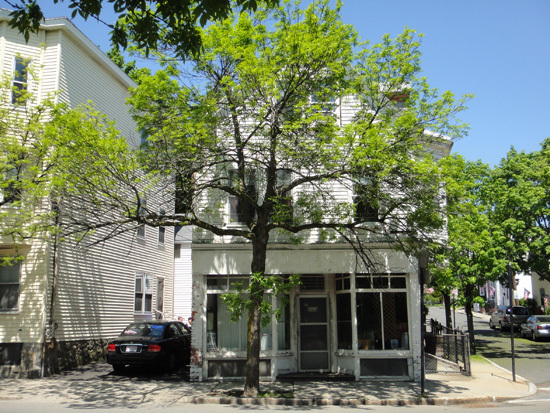 This site details the characteristics of the lilac tree's leaves and mentions most of the details I identified along with a few others. 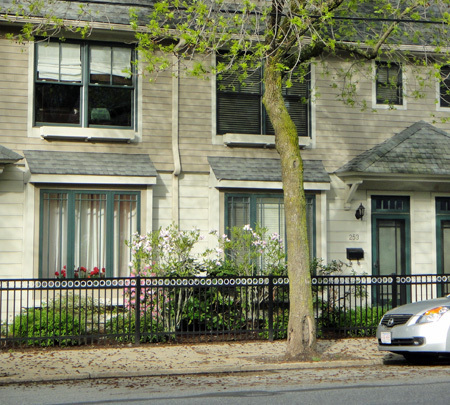 And this site describes the main characteristics of the entire lilac tree, including the bark, which I didn't discuss. 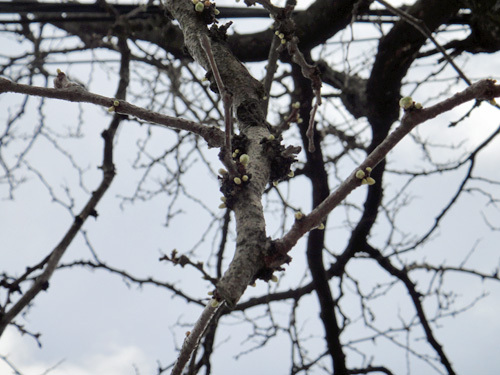 This page provides a thorough description of the lilac tree which includes many details on the male and female flower structures and the fruit. And even if you don't look at any of those, you MUST check out this page from microscopy-uk that has amazing pictures of all the structures in the lilac flower! Mind blowing! 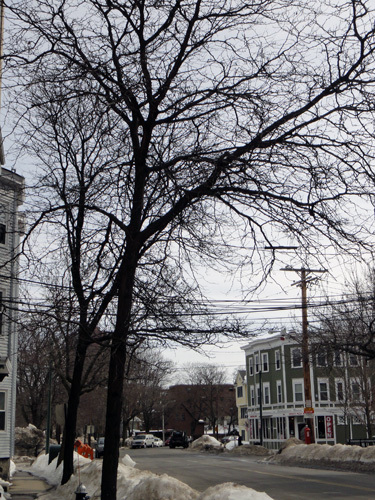 Back in February, I took a walk through the neighborhood to look at trees. I saw interesting bark and different types of buds and a lot of snow. 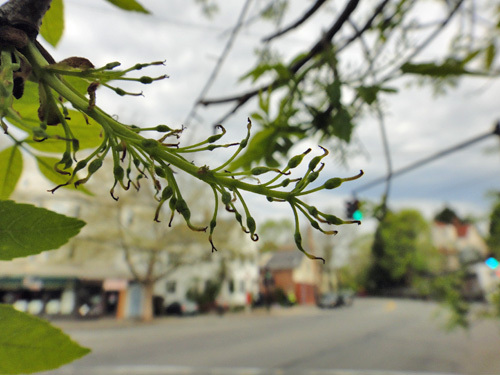 This weekend, we had our first non-rainy day in about two weeks, so I popped the camera in my pocket and set off on a springtime neighborhood tree walk. 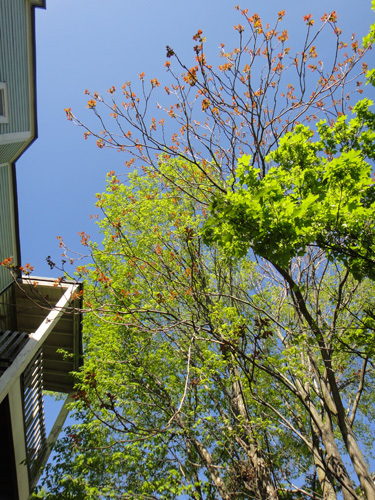 I spotted the kooky honey locusts, finally starting to green. And discovered a group of birds flitting about in them. Apparently, they do not find the twisted, gnarled twigs as spooky looking as I do. Speaking of birds, I spotted this in a tree by our parking space. I haven't seen any birds around it yet, but the car has been covered with their droppings in the last couple of weeks. I actually get kind of excited each time I come to the car and see new bird poop on it. I start searching up in the trees to see if the birds have returned to their nest! The trees by our parking space are an interesting bunch. There's the Norway maple that I've been watching and the tree with the incredibly long roots. 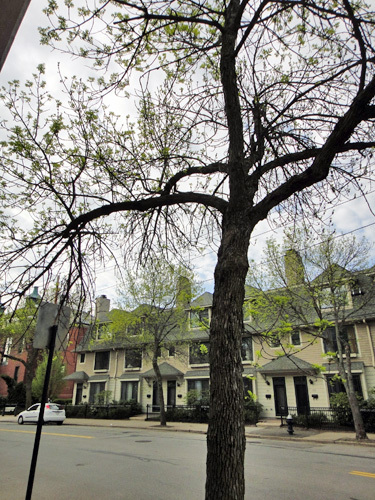 The root tree looks almost bare among its green neighbor trees. 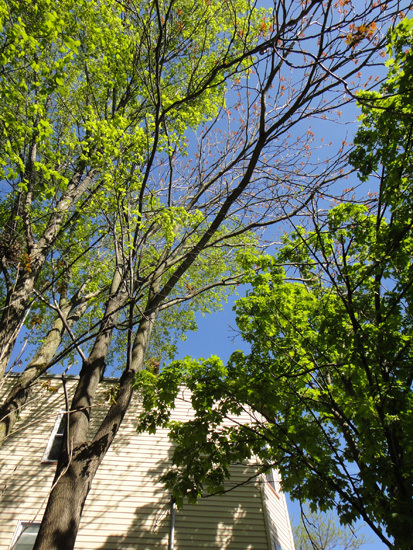 But if you follow the branches up, they end in lovely orange-y leaves. I have no idea what kind of tree it is. 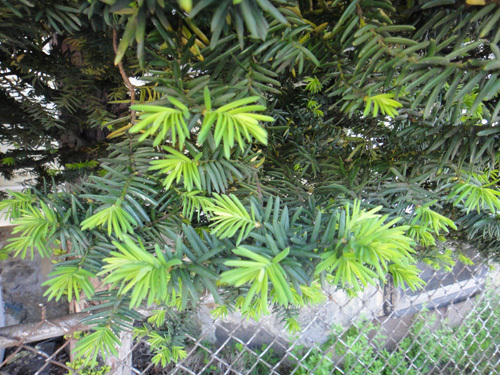 It seems to have compound leaves similar to my tree's, but they're so high that I can't distinguish any of the details. Closer to the kids' school, there is another tree that has intrigued me for the last couple of weeks. I don't know what kind it is either, but it has heart-shaped leaves all along every branch. 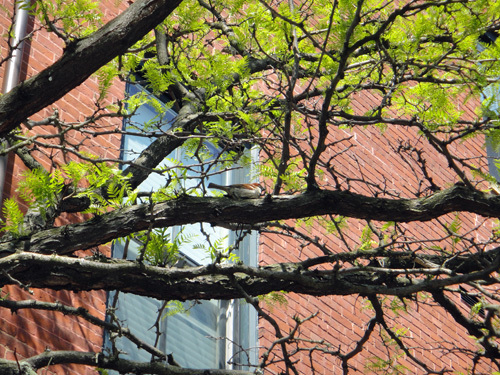 I have to admit that I originally thought leaves would come out everywhere on a tree, but now that I've looked closer at trees, I can see that they are usually on the tips of the branches, leaving the bark bare. This tree, with its almost vine-like covering of leaves, reminds me of an extremely hirsute man with hair where it shouldn't be. 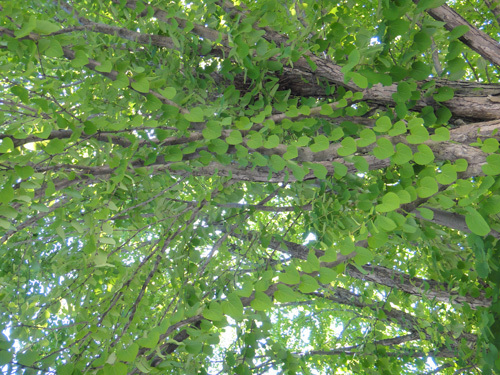 Each of those leaves is directly attached to the branch with one stem. The tree seems to have no need for twigs at all! 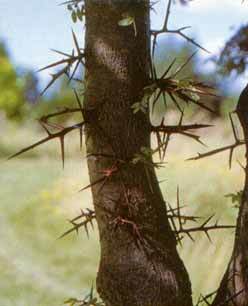 Another tree that amazes me is this one, with enormous leaves the length and shape of my foot and huge clusters of flowers that hold themselves straight up on the twig. The flowers have pretty little red and yellow dots in the center. I think this might be a Horse chestnut tree. It is magnificent. 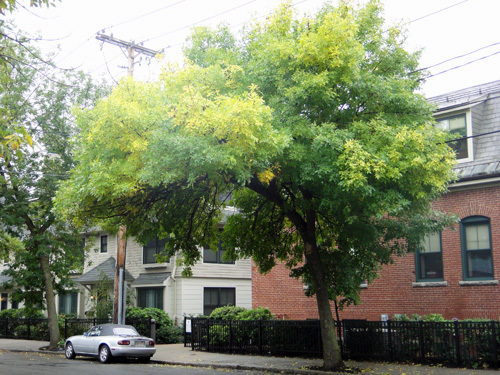 On my way back home, I was surprised by the full canopy on this ash tree just a block away from my house. 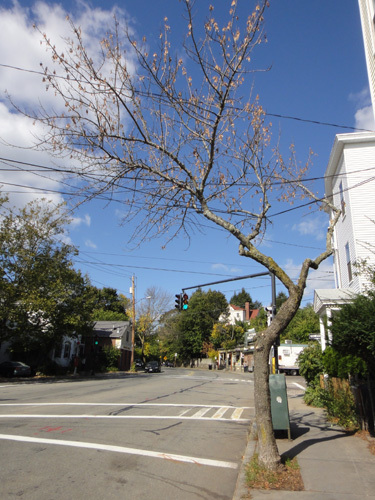 This ash is a good two or three weeks ahead of the others on the street. It looks fully developed, whereas mine definitely looks like it's still just getting started. 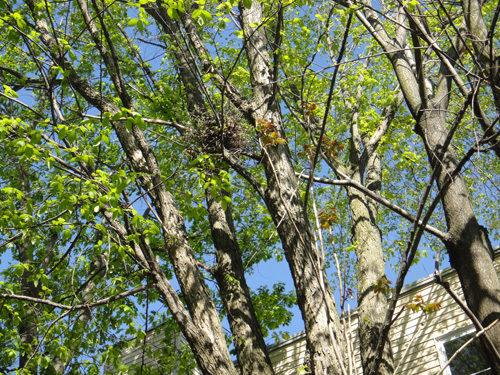 Now that the leaves are arriving, I can tell just how many of the branches on my tree are dead. There are whole sections, maybe a third of the tree, that remain completely bare. I wonder if my tree will ever fill out like the ash down the street. 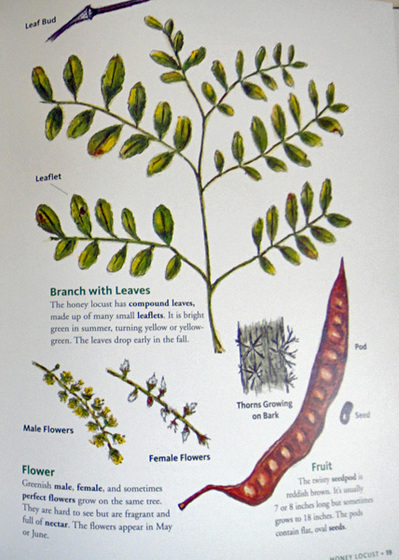 I wonder how the honey locusts will look when they have all their leaves. 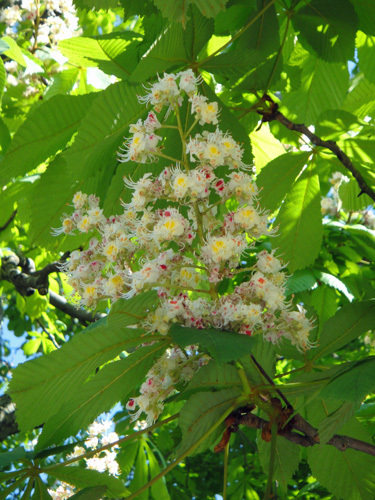 I wonder when the horse chestnut will lose its flowers and begin to drop chestnuts all over the street. I wonder when the birds will return to their nest and when they will leave it again. More sun and more rain means more green! Our sad little tree in front of the house has started to change. 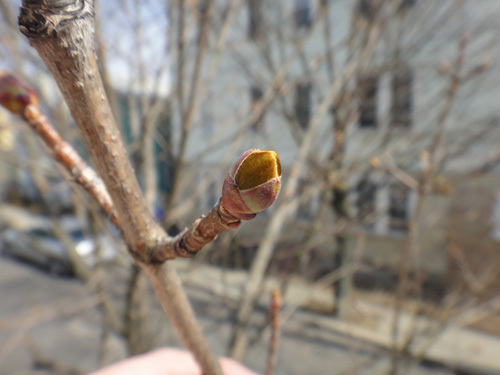 The buds were reddish before last week, but now they're opening up to reveal a golden green. 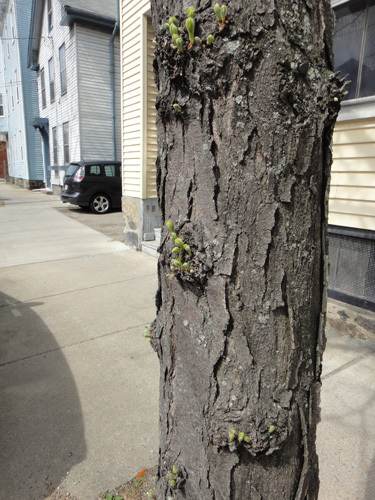 By our parking space, this tree seems to be sprouting lettuce! And my daughter spotted this in a nearby sidewalk cutout. There used to be a tree in this spot, but it was removed about 5 years ago and the town didn't replace it. Looks like someone planted some bulbs in there this year. 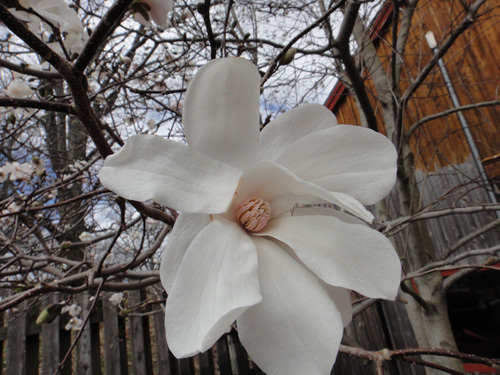 My daughter and I have been looking for signs of spring during our regular visits to the zoo and this week we noticed that a magnolia tree had burst into bloom practically overnight. 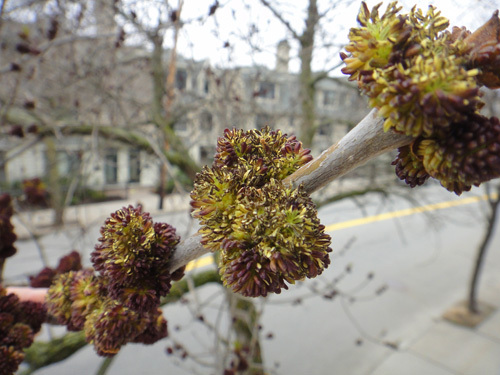 I took a picture of this same tree just two weeks ago: buds closed. Now, there are humongous flowers. The back is even cooler. 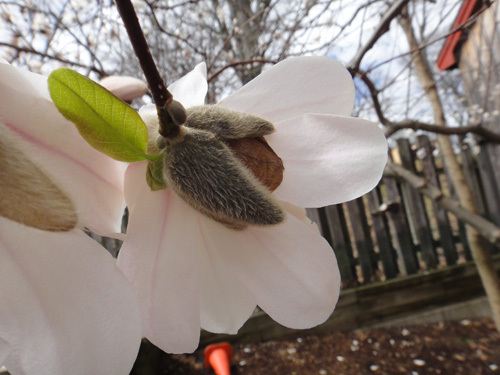 You can see how the bud opened up to reveal the flower. Look, it's even hiding an early green leaf back here! 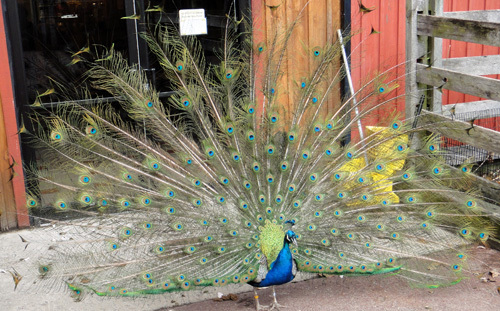 Next to the tree, one of the zoo's peacocks was showing off his spring green too. 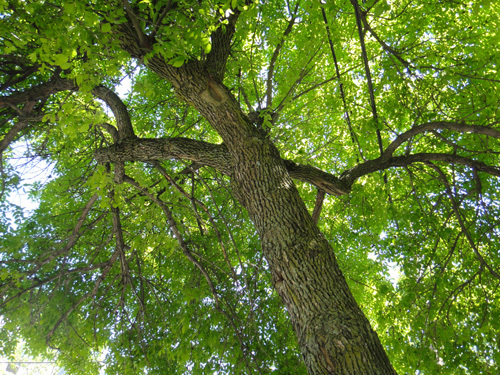 This page is an archive of recent entries in the other trees category. oak is the previous category. questions is the next category.